Chelsea will need more than a fortunate victory to turn around unhappy atmosphere at Stamford Bridge. Chelsea and Maurizio Sarri – moreover anything – will be looking for a good performance against Brighton & Hove Albion tomorrow. With the supporters’ call for the end of ‘Sarri Ball’, you cannot help but feel like a win just wouldn’t be enough to please the disgruntled fans. They need to win and win well against a Brighton team facing a different battle entirely. The Seagulls sit just five points adrift of the relegation places but do have a valuable game in hand. That game, tough, becomes futile unless they capitalise in tomorrow’s match. Sarri’s side sit in sixth but are just one point away from the last Champions League spot currently occupied by Tottenham Hotspur who face Crystal Palace on the same day. Chelsea head into the match looking to continue their streak of good fortune following their most unlikely of comebacks late on against Brighton’s relegation battlers Cardiff City. The Blues have won five of their last seven matches in all competitions including two stand out performances, first in a 2-0 home win to top-four rivals Tottenham and more recently away at Dynamo Kiev where they cruised through with a 5-0 victory (8-0 on aggregate) to the Europa League Quarter-finals. Likewise, Brighton also head to Stamford Bridge with a certain degree of confidence despite losing their last match to fellow strugglers Southampton. In their last three matches prior to the defeat to the Saints, Brighton have earned a maximum six-out-of-six points at the expense of Huddersfield Town and Palace and prevailed to the Semi-finals of the FA Cup after beating Championship outfit Millwall on penalties. The two club’s history? Well… there isn’t much at all. The two have only played each other 11 times and there first came in the 1933 FA Cup. 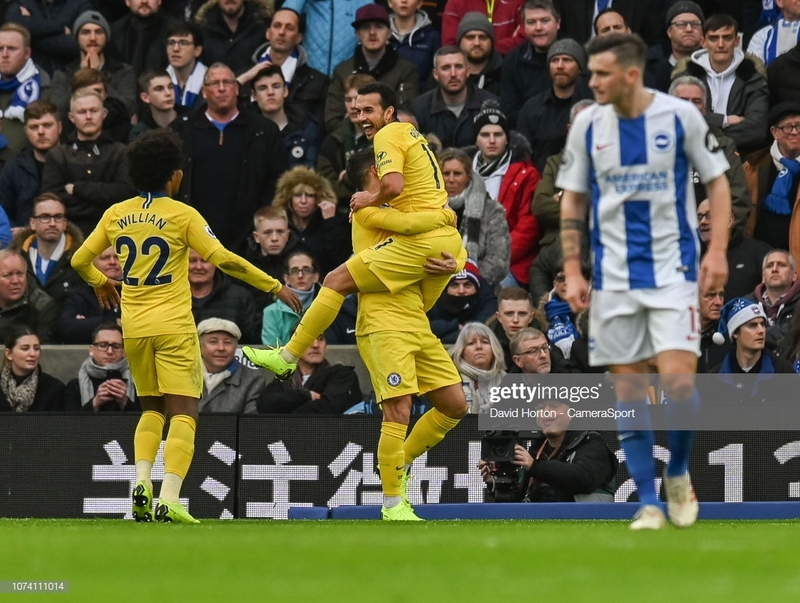 Brighton won the game 2-1 and sent Chelsea packing in the third round of the FA Cup. In turn, Brighton’s reign over Chelsea was short lived. Of the next 10 times the two sides met, Chelsea won nine of them and have won every time the two have met in the Premier League. In this fixture last season, Chelsea were 2-0 victors following goals from an all-Spanish partnership of Alvaro Morata and Marcos Alonso. The reverse fixture earlier on this season was a little tighter at 2-1; Pedro and Eden Hazard got the goals. Ruben Loftus-Cheek impressed and scored in Chelsea’ comeback in Wales. He may be rewarded with a rare start. Likewise, Callum Hudson-Odoi and Hazard who were both left on the bench could be expected to return to inject pace and life into a stale Chelsea team. Predicted line-up: Arrizabalaga; Azpilicueta, Luiz, Rudiger, Alonso; Loftus-Cheek, Jorginho, Kante; Hudson-Odoi, Higuain, Hazard. Brighton’s team is a little more complicated and faces Chris Hughton with a few more problems. The manager confirmed that they will be without creative midfielder Pascal Gross due to a hamstring strain. However, Florin Andone may make a return to the side- he returned to training earlier this week. They may elect to rest key players for their FA Cup Semi-final match against Manchester City. Predicted line-up: Ryan; Montoya, Dunk, Duffy, Bernardo; Propper, Stevens, Bissouma; Knockaert, Murray, Jahanbakhsh.